The Grindmaster-Cecilware 2K-GB-LD Budget K Cappuccino Dispenser makes it easier than ever to display and dispense a wide variety of drinks that your customers will love. This beverage dispenser is 20 inches deep. Fast Flow - Dispenses beverages 30% faster, reducing wear and tear on major dispenser components. Slanted Whipper Chamber - Provides optimal mixing of product & keeps it flowing away from the motor seal. Vacuum Steam Removal System (VSRS) - Ensures the powdered mix remains dry to eliminate clogging, caking, & bridging. Your Choice of Back-Lit or Non-Lit Display - Models are available with cost saving non-lit-display or eye catching back-lit display. 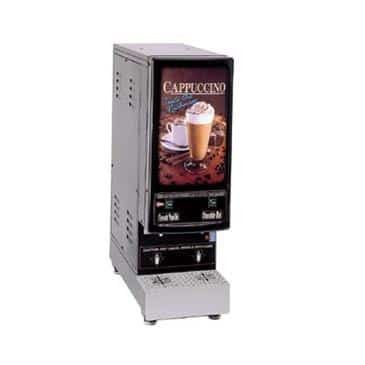 Lower Cost Same Great Features - These models utilize the same reliable components found in all Cecilware hot beverage dispensers and are designed to service medium volume locations using minimum counter space.